THE VOTING PUBLIC got their chance to ask questions of the leaders of Ireland’s five main political parties – but did they get them answered? 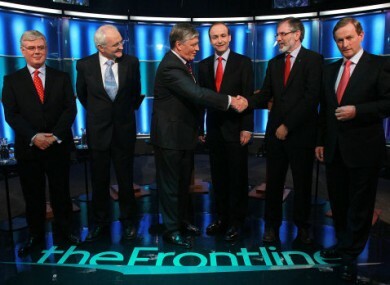 The second leaders’ debate took place in the RTE studios at Montrose with Enda Kenny, Eamon Gilmore, Micheal Martin, Gerry Adams and John Gormley all standing at podiums. Unlike the TV3 debate between Gilmore and Martin, it was the audience members who got to pose questions through moderator Pat Kenny. Chosen by Millward-Browne Lansdowne, they were decreed to be undecided voters. The hour-and-a-half long debate was long enough for the occasional body blow, mostly between Micheál Martin and Gerry Adams, quite a few repeated catchphrases and – shock horror – the odd bit of common ground. The personal stuff: There was the usual policy and party line arguing, but Eamon Gilmore’s repeated interruptions of Enda Kenny clearly got on the Fine Gael leader’s wick at one point. Gerry Adams drew a negative ‘ooooo’ from the audience when he told Micheal Martin: “Let me speak, Micheal, You make the DUP sound like altar boys”. Micheal Martin bided his time until just before the interval when he told Adams that he wouldn’t listen to him “lecture” anyone on fraud, considering the “baggage” he brought to his political career. Peacemaker of the night: John Gormley’s response to the audience member who wanted to know why the election campaign was about points-scoring and not policies was that it was time to “Stop the bickering and serve the people”. A nation assented with a sigh. Question #1 came from Finian, who has lost three children to emigration. He wanted to know if there were any meaningful reasons for Ireland to survive. Enda Kenny: He wants this country to be, by 2016, the best small country in the world in which to do business, raise a family and enjoy an old age with dignity. Micheal Martin: He sympathises with Finian and says we should open up government to allow additional expertise in. The creation of jobs as we did in the 1990s is possible, he thinks. Eamon Gilmore: Takes a personal tack with Finian and says, “you and me, Finian, we didn’t think we would see this again”. Ireland can be great again but we have to “create jobs” and make our economy prosper again. Gerry Adams: “We need a real republic, based on real republican values”. This means putting money into creating jobs. John Gormley: Like Gormley, he takes the personal line – “I had to emigrate in the ’80s and I was lucky to be able to come back”. Insists radical reform of our political system is vital. Question #2 came from Natasha, who was worried about friends who are in trouble with their mortgages. She asked: Why are the banks being bailed out when those struggling with their mortgages not? Martin: Insists deferred interest scheme and mortgage relief DO help out people. Moderator Pat Kenny interrupts him – the first interruption of the night – to focus him on Natasha’s question. Martin replies that it isn’t an option not to bail out the banks because the country wouldn’t operate without them. It would be “worse in terms of unemployment and disruption”. Kenny: Calls it “an obscenity and a scandal” that money had been pumped into incompetent banks. Doesn’t intend to give more money to Anglo Irish and says the bailout money would have created 200,000 jobs if it had been used elsewhere. Martin chips in that Fine Gael approved the bailout. Gilmore: Labour was the only party here that opposed the bailout. To answer Natasha’s question, the Labour’s party approach is to give people a guarantee that they won’t lose their home as long as they are making a “reasonable effort” to make some sort of repayment. Adams: “People in politics have to make political choices that help that lady”, ie, Natasha. Again, says there will not put one red cent into any of these banks until they are restructured. He also manages to mention “golden circles and elites”. Gormley: Says all the other parties have been accepting donations from banks and developers – but that the Greens have “never acccepted a red cent”. Adams: Wants to scrap the Universal Social Charge and instead bring in a tax band for those who earn over €100,000. Kenny: Promises to wind down Anglo Irish and Nationwide by the end of the year and renegotiate the EU/IMF deal. Martin: Claims that “Gerry’s menu” – wanting the IMF to get out of the country, wanting rid of the bank debt, wanting to pump in €7bn to spending – would make him a “great host of the Late Late Show” because with Gerry, there would be something for the audience every night. Adams drops in a (slightly dated) pop culture reference of his own about magician “Paul Daniels” not being able to do what Martin suggested. Gormley: Says Adams’ figures don’t add up. “As much as it stuck in my craw to assist those banks, we had to assist these banks,” he says. He also says that on the evening of the bailout, Central Bank head Patrick Honohan “stated very clearly” that this was the route to go. Gilmore: We opposed the banks – “It was the biggest bank robbery in the history of this country and it was the banks that robbed the people”. He refuses Pat Kenny’s assertion that we would be in the same place now had they just nationalised the banks. Question #3 came from Seamus, a farmer, who spoke of how his local GAA club, the heart of the community, had been decimated by emigration. “It’s just a disaster out there in rural Ireland,” he said. His question was simple: How are we going to get these people back working? Gilmore: We could get down retail rents, and in the longer term, we have to build up sectors like alternative energy, food, tourism. Insists that his first job on day one in government would be to sit down with the agencies that deal with jobs creation and find out what they’re doing. Adams: I agree “generally” with what Eamon has said. But also, “all these parties to my right”, why don’t we all take pay cuts and all those at the top of the public sector have their salaries kept at a €100,000 maximum. Gormley: Education is vital; 3 per cent of our GDP should be going to research and development. Our agriculture exports are up so it shows our clean, green image is vital. As he begins to talk about retro-fitting our infrastructure, Pat Kenny has to shut him down while Gormley claims he has had less time to speak than the others. Martin: We must let support Irish companies but also attract in the likes of Google. We have a €35bn capital programme there for building. Kenny: Suddenly he brings it back to the bank guarantees, claiming that he had wanted to divide Anglo into good and ‘toxic’ banks. He asserts Labour wanted to create five Anglos. On the jobs question, he outlines the famous five-point plan to “get Ireland working” (we’ll be hearing a lot of that phrase this evening). Gilmore: Has a pop back at Enda for the Anglo blow, saying Enda “wasn’t able to distinguish the one Anglo on the day (of the bailout)”. He also says that Fine Gael want to follow the austerity measures that Fianna Fail and the IMF imposed and that has to be changed to allow growth and jobs to be created. Adams: We never voted for bank guarantee. (Martin: “You did, Gerry”). Adams: Gets on to the issue of natural resources, claiming we’re giving ours away to foreign multinationals, like with gas fields. Gormley: Speaks about renewables, wind and wave energy, as being our greatest national resource and that the Greens’ plan to harness them are on target. Martin: Gerry still hasn’t answered where Gerry is going to get the €50m to continue paying wages; where he’s going to get €7bn? Adams: “Please let me, Micheal. You make the DUP sound like altar boys”. (To audience gasps). Gilmore: Micheal Martin is going around the country being the “great pretender”, “pretending” that he wasn’t “Bertie Ahern’s apprentice”, that he wasn’t “Brian Cowen’s salesman”. Question #4 comes from Ruth who is self-employed, works in the arts and has three children. She wants to know that if the parties are not proposing raising taxes, who is going to suffer from the cuts that are being proposed? Adams: Believes in a wealth tax, believes cuts to politicians’ and senior public servants’ pay will save half a billion, and we shouldn’t put a red cent into the banks until they are restructured. Kenny: People are already suffering across the board – we believe that the tax bands and rates should not be changed so people can be left with as much money as possible. Gilmore: Measures that will get people back to work will help. Our cuts begin at the top – of doing things more efficiently at the public finances end. There is €5bn missing that we need to make up – FG and FF haven’t told us where that will come from. Kenny: Claims that Labour has “changed tack” over their own projections about what cuts are needed and pushed the date out. Gilmore: Your budget document has no growth rate projected at all! Martin: Adresses Ruth and says every department will have to cut back – “we will be looking for more for less” from public service. Adams: “Everyone shouldn’t have to suffer, You shouldn’t have to suffer Ruth”. He says again that he’s talking about citizens not having to carry the burden of “big banks and the golden circle”. Martin: We have to borrow €19bn to keep everything going next year. Where is Gerry going to get that? Gilmore: I think it’s important we are straight – there is no such thing as the “fairytale economics” which Gerry talks about. The “surgery, not butchery” line comes up here. Gormley: Tells Gilmore that he opposed the carbon levy and now is saying he would increase it. Says people are going to go away confused, he claims. Pat Kenny poses a question that will turn out to be a spark to a blaze burning between Adams and Martin. He asks about cutting out fraud in the social system – is that the only big way to save money? Gormley: You can’t save €1bn as Labour said. Gilmore: We don’t mean just fraud – we mean reform of the social system in total. Adams: He begins to speak about fraud being pervasive in Ireland and Martin jumps in to tell him that he won’t “take lectures” from Adams. He also asks him “how dare” he speak about fraud “down here in the Republic”, and says he should be more humble considering the “baggage” Adams had. Adams countenanced that he is a “very humble” person. Luckily for their handlers, the interval in the Frontline debate came at this point. Question #5: Fiona has had health problems and feels she is stuck in the middle of the health system in that she can’t pay top dollar but doesn’t qualify for a medical card: Why do you need money now to get healthcare, she asks? Gormley: That is the truth. We have a two-tier health system. Those who have money don’t have to wait. The HSE has been “an experiment that just hasn’t worked”. Universal health insurance is going to be expensive and take a long time to kick in so we want primary health care to be improved – it would deal with the A&E overload. Adams: Tells the story of visiting Our Lady of Lourdes hospital in Drogheda where people were sleeping on trolleys and “one young woman was on the floor”. We have a healthcare system that is not worthy in a republic that calls itself a republic. Martin: There has been an expansion of the health service in recent years – we treat more people and with better outcomes than ever before. Kenny: The health system Martin has created “has failed the Irish people”. As “part of our five-point plan”… he agrees somewhat with Adams on the issue of people waiting on trolleys. Gilmore: It is “wrong, unfair, immoral” to treat people “on the basis of how deep are their pockets”. This is a policy area where we are in “broad agreement with Fine Gael”. Universal health care is his policy too. Gormley: Is more than happy to join Labour and FG on universal health care but wants to see the figures and see how they adds up. He wants to phase out the tax breaks for people who take out private health insurance. Pat Kenny puts it to Adams that universal health care has a fair wind behind it. Adams replies that health care should be free at point of access. He tells another anecdote, this time of a woman who has seven children in Dundalk, they closed the hospital, her husband’s moved to Navan and she has to make two bus journeys to see him. Martin: What Enda is proposing is to borrow a billion to get this done in ten years.The last thing people in the health service need is another damaging overhaul. Kenny: Martin should be “ashamed” to speak of health issues in this country. “People who have died because they can’t get on waiting lists”. I agree with John Gormley. Martin: “Stop talking nonsense”. Claims Kenny wants to privatise the health service. Kenny: Calls this absurd and “a pathetic defence” of Martin’s own performance as health minister. Gilmore: Speaks of the example of the NHS in the UK and says that the Labour party would be passionate about reforming our health system. An expert group set up by the present government said that 20 per cent savings can be made in this health system, he says. When Martin begins to talk about the “massive cost of recapitalising”, Gilmore says he is fed up with Martin’s “claptrap” after he has had 14 years in power. Martin groans: That again… to which Gilmore responds with the perennial (tonight anyway) jibe that Martin is a class of “Rip van Winkle”. Adams: “Healthcare should not be about profit. Healthcare should be about cherishing all the children of the country equally.” He speaks about the need for suicide prevention strategies. The final question – Question #6 - comes from Derek, formerly in construction and who started his own business which he finds tough but has no alternative because of the lack of work in his previous industry. He asks: Why is it that political debates revolve around political one-upmanship rather than concrete policies? Kenny: Starts listing out ways he can help Derek particularly – rent reviews, streamlining tax systems etc. Manages to get in that ‘Let’s Get Ireland Working’ slogan one last time. Gilmore: He explains that there will always be a certain amount of bickering in a studio with five leaders in it. Thinks what we have to do is commit to working together, politically, and get it into our heads that we are “one Ireland”. Martin: We do need to change the way we do politics in this country. We put in a proposal for single-seat constituencies. We should open government up to expertise. “Punch and Judy shows” is what we’re getting in the Dail. Gormley: That’s what we have been saying for ages. Gilmore: We need a new constitution. Kenny: The language of politics has got to change. Email “Punch and Judy, red cents and Rip van Winkle: How the second leaders' debate panned out.”. Feedback on “Punch and Judy, red cents and Rip van Winkle: How the second leaders' debate panned out.”.